Princess Lamballe. Tragedy of the French Revolution. Home » Princess Lamballe. Tragedy of the French Revolution. Marie Therese Louise Lamballe, of Savoy, Princess of Carignan (1749 – 1792). Historic tragedies have their lessons of instruction to after-generations; they tell their sad tales of sorrow and anguish, which make ears tingle and hearts weep in sympathy. They form graphic chapters in the history of our common humanity, however much we may reluctate to own the relationship. The mind almost refuses to believe that the dreadful scenes and tragedies of the French Revolution, so forcibly styled “the Reign of Terror,” occurred in Imperial Paris, the gorgeous capital of France, and the most fashionable emporium of the present modern world, and within the recollection of many persons now living, even among our friends and neighbors. 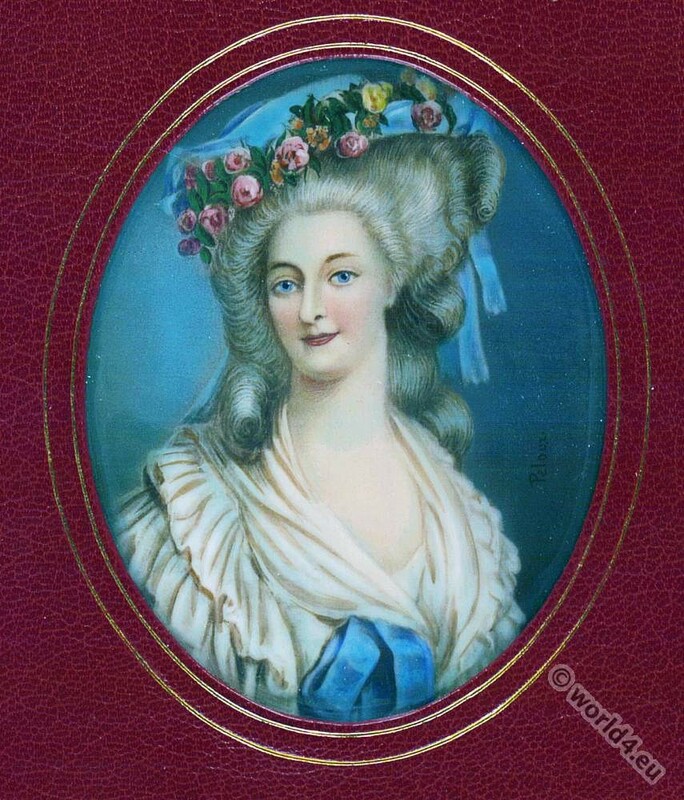 Princesse de Lamballe (1749-1792). 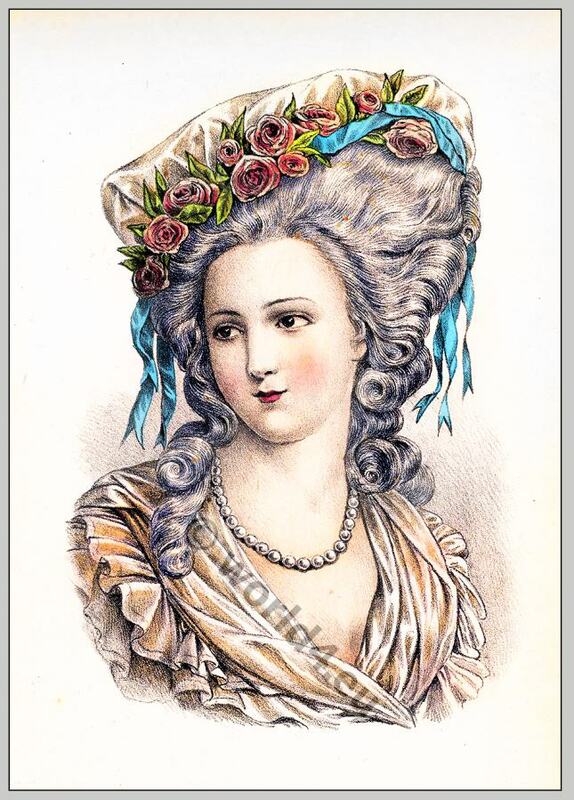 Coiffure Louis XVI. Marie Therese Louise Lamballe, of Savoy, Princess of Carignan, was born at Turin, September 8, 1749. She was married to the Duke of Bourbon Penthievre, by whom she was left a widow, young, beautiful, and amiable. She was early remarked for her intelligence, sweetness of temper, and personal beauty. In 1767, she was married to the Prince of Lamballe, son of the Duke of Bourbon-Penthievre. This union was not happy, and the Princess was about to seek a separation when her husband died, May 7, 1768. 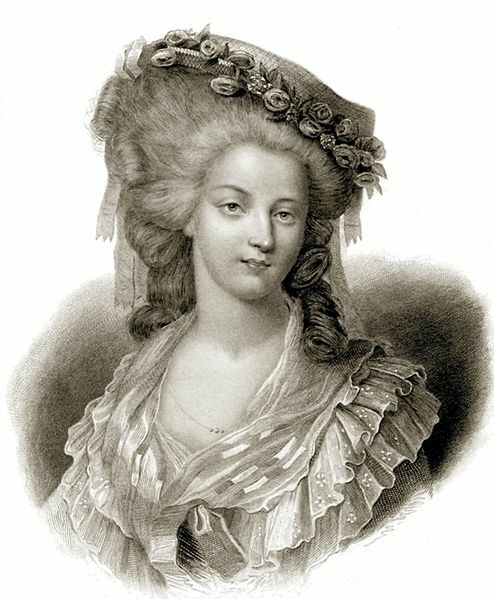 On the death of Marie Leszczynska and Madame Pompadour, a marriage was proposed between her and Louis XV. ; but the project was defeated by Choiseul and his adherents. When Marie Antoinette came to France, she conceived a strong attachment for the Princess, and on her accession to the throne, appointed her superintendent of the Royal Household. The Princess m return proved a devoted friend. She saw without jealousy the growing favor of the Duchess of Polignac, and silently kept aloof; but when the latter, on the breaking out of the Revolution, deserted her mistress, she returned to her post. 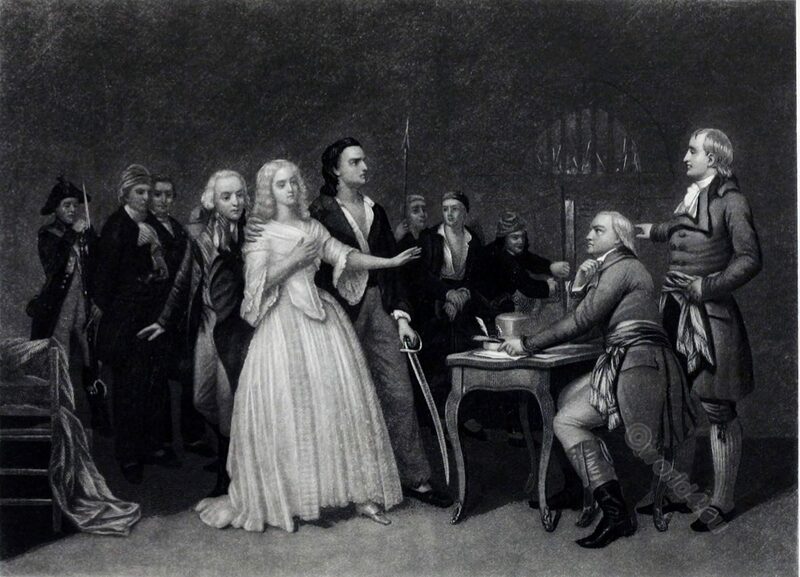 She was at the Queen’s side on the dreadful days of June 20, and August 10, 1792, and accompanied her to the Legislative Assembly and afterwards to the Temple. On August 19, she was separated from her mistress and confined in the prison of La Force, where, despite the most energetic measures to save her, she fell a victim to the September massacre. When she appeared before the tribunal which passed sentence upon the prisoners, she answered with firmness and dignity. She refused to take the oath against the King, the Queen, and the monarchy, and scarcely had the verdict, “Out with her,” been uttered, when she was struck down with a billet by a drummer-boy, and despatched with a sword. A butcher-boy cut off her head; her body was stripped naked and exposed to the crowd her heart was torn out, still palpitating, and placed with her head upon a pike, and these bloody trophies were carried first to the Palais Royal, where the Duke of Orleans — her brother-in-law — was forced to salute them, and then to the Temple, where they were paraded under the windows of the unfortunate Queen and her wretched family. Not satisfied with this, the people went in procession dragging the mangled body, with fresh insults, triumphantly through the streets. This illustrious female was one of the most innocent victims of the Revolution; her name was never attacked with revolutionary or libellos invectives; and though her tyrants cut her off by a horrid assassination, they never dared to asperse her character. Source: Imperial courts of France, England, Russia, Prussia, Sardinia, and Austria. Richly illustrated with portraits of imperial sovereigns and their cabinet ministers’ with biographical sketches by Walter Hilliard Bidwell. New York: C. Scribner, 1863. The Execution of Louis XVI. Fashion under the French Revolution & Directoire 1789 to 1802. Incroyables and Muscadins. The French directory dandies. Nymphs and Merveilleuses. The ball of the victims. The Days of the Directoire. 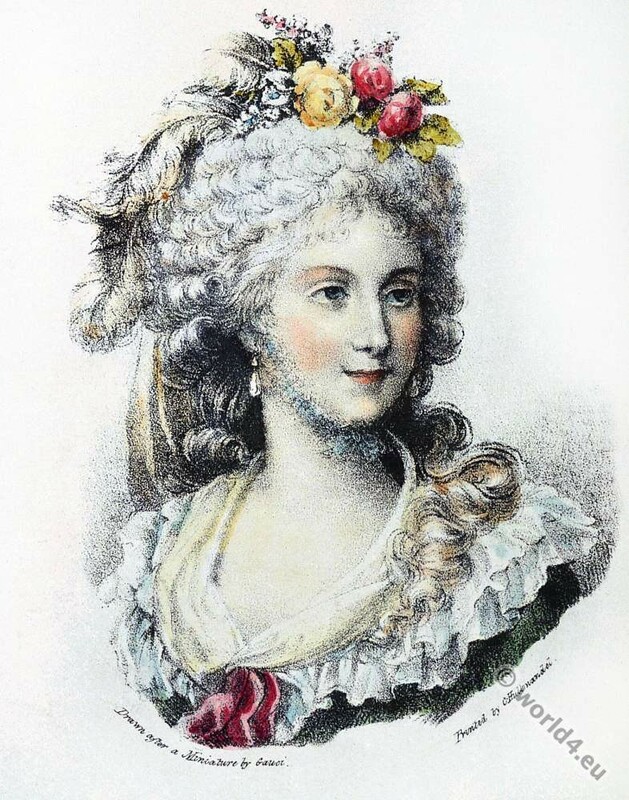 Fashion after the French Revolution 1796. Les Incroyables et Merveilleuses. Drawings by Carle Vernet, Horace Vernet and Louis-Marie Lanté. This entry was posted in 1792, 18th Century, Directoire, France, Nobility and tagged French Revolution Costume, Portrait on 12/13/18 by world4.